July 11, 2015, Brenda Spade fulfilled a dream. "I love to eat at small, independent restaurants that have homemade food and a friendly, fun atmosphere, and I was ready to try doing something of my own," she says. "I knew the kind of place I wanted to own—a place people would feel special and welcome, [a place that would] serve great homemade food and become part of the community. So with the help of family and friends, I took a leap of faith and made the cafe into what it is today." That cafe is Cobblestone Cafe and this year marks its 10th anniversary. Three generations of women, along with seven other employees, serve homemade quality food made in-house daily. Their first-rate customer service has delivered unparalleled loyalty—many customers are regulars. More than 30 years ago Spade was working a full-time office job and bartending at night. "I realized how much I liked the fast pace and never-a-dull-moment of the food industry," she says. "Once I quit the day job there was no going back—I met great people and learned a lot." Spade spent 20 years working at Drawbridge Inn, and later had stints at Chez Nora and Warner's Restaurant. Ten years ago she noted the space where Cobblestone now stands was for rent and Spade saw potential. "The first three years were a challenge," Spade says. Her daughter, Jen Black, helped open summer 2005 but then went back to school to finish out her senior year—Black graduated Miami University in 2006. "There were a lot of very long days and nights—we were busy right from the start," Spade says. Black took a job with Hyatt Hotels in Dallas, Texas, upon graduation, but says it wasn't truly what she wanted to do. "After many late-night phone calls with my mom it was decided that I should come back and help with the cafe," Black says. "Business had picked up quite a bit in the time that I was gone and it was just too much for one person to handle." It was a decision that left Spade forever grateful. "She is my rock and does a great job," Spade says. Cobblestone Cafe also employs Spade's 80-year-old mom, Joan Spade. "She is amazing for a woman her age," Brenda Spade says. "She keeps us on our toes and the customers love to talk to her." And then there is Brenda Spade's sister, Holly Bram. "She is a high-energy person that keeps the kitchen together," Brenda Spade says. The positives of working so closely with family? "Having people you trust and who care about your success working with you," Spade says. And the negatives? "We are all strong-willed women and have our own way of doing things." And it's these positive and negatives that keep customers coming back—customers of all ages. Eight-year-old William Kidney has a birthday celebration at Cobblestone the Tuesday of his birthday week, every year—his choice. "It's our second home," his mother, Nancy Kidney, says. "He's grown up there." And then there's Doris, a housebound woman who lived across the street. For a year and a half, until she died, Spade and Black would hand-deliver food. "She would call every morning to see what desserts we had and if it was something she liked she would order that and coffee," Spade says. "Jen or I would take it across the street to her and chat a bit—she always wanted to know what the weather was like and would tell us the news of the day. In the afternoons she would order lunch—her favorite was BLT and chili. Her son had asked us to do it Saturday only, so we said OK, but it became and everyday thing, which was fine because she was such a sweet lady and she loved having someone stop by each day." From the beginning Cobblestone also has catered—mostly party trays as a pickup service, with limited delivery. "We also do box lunches for business and doctor offices—Dr. 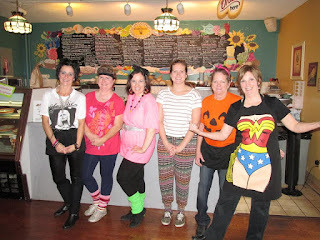 Stull's office crew is one of our regulars." 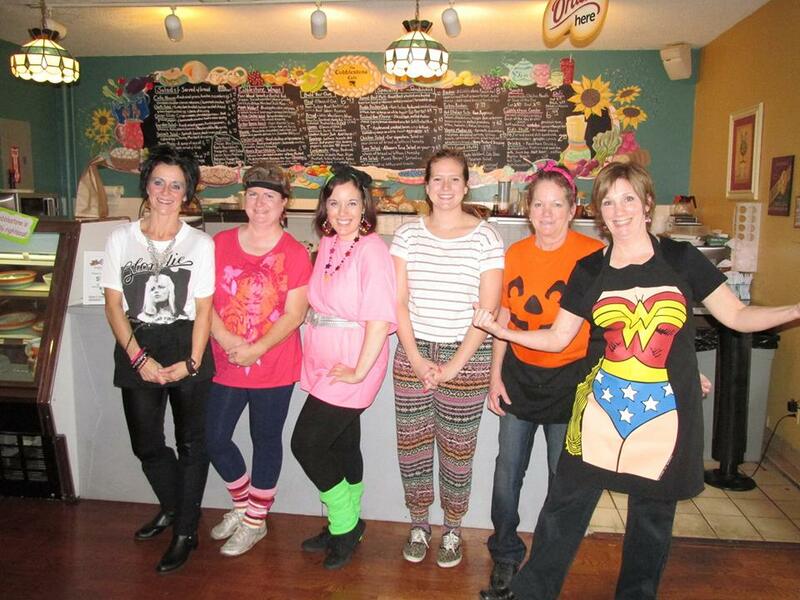 In a way, Cobblestone's employees have become family for the Fort Thomas community. Black's daughter, Ella, was born June 8, 2014. "Everyone saw me grow when I was pregnant and waddling around the restaurant so they they had grown quite attached to Miss Ella, even before she was born," Black says. "Once I had her and went on maternity leave I sent picture collages to Mom and she hung them on our community bulletin board." Watch Ella Grow is now a staple of that bulletin board—each week Black posts a new picture of Ella, much to many customers' delight. Time off, whether it be maternity leave or a vacation, is difficult for Spade and Black. Spade just returned from a vacation—her first in five years. "It's very hard for Jen and I to take time off because we do so much of the work ourselves—we are the prep people, sandwich makers, cashiers and everything else. When one of us is gone it makes it rough on the other. We are so lucky to have some longtime employees who are willing to help us make it work, and I would like to give them recognition for all they do—Kathy, Allie and Barb." And yet, both Spade and Black love what they do. "The Fort Thomas community has been so supportive and our customers have become our friends," Spade says. "We love when people come to celebrate special occasions and have enjoyed watching so many kids grow up here—we call them our Cobblestone Kids. ... Our customers care about us and we want to make their visit with us a great experience and we appreciate all their support—that is why we're here." Black considers Fort Thomas to be an ideal small town. "We believe that every small town needs a place where friends can meet for a bite to eat and have a conversation," she says. "Our mission statement says it all: Cobblestone Cafe is where fresh is much more than a menu item—it's a cheerful hello! Come in. Sit down. Relax. Go off the grid. Even if just for an hour." Bruno Mars Coming to Fort Thomas? What's Going on in Fort Thomas this Summer?